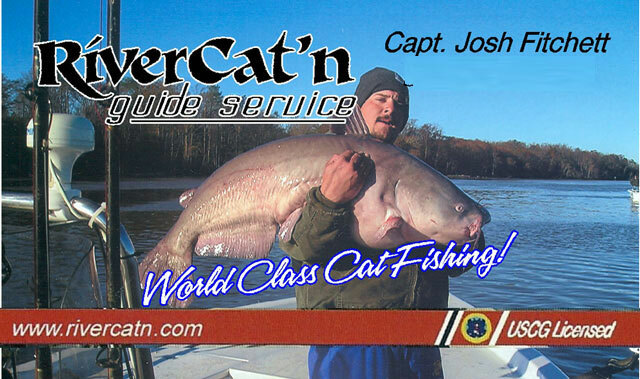 Captain Josh helps brake the Maryland state record for blue catfish, with the second Maryland State record breaking cat in his boat, the first record breaker was in 2006. The August 13th catch was made while on a guided trip for Matt Jones, Matt's dad Ed Jones, and Matt’s buddy Thomas Stevens. 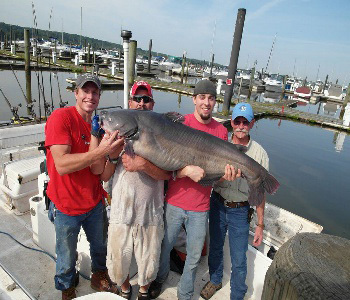 Catching the 84.28-pound blue cat on the tidal Potomac River near Fort Washington. 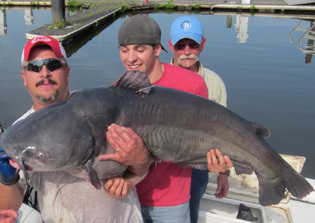 The DNR also measured the monster cat at 52" long and a 37" Girth. Gizzard shad was the bait on an 10/0 Demon Mustad Circle. Other tackle included a Berkley rod with a Shimano Tekota reel spooled with 50-pound test Cajun Red monofilament line,a 24-inch, 100-pound leader and a 14 oz inline sinker that snagged the record-breaking fish. The monster cat was tagged by DNR for tracking purposes and successfully released live & well. 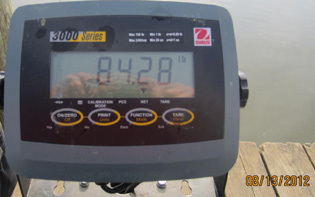 The previous Maryland blue catfish record was an 80-pound, 12-ounce fish caught in February by Shawn Wetzel of Orrtanna, Pa., near where Jones caught his record fish. . Blue catfish were first documented in the tidal Potomac in the mid 1990s, and have increased in numbers and size since that time.